Relieve your pain. Restore your life. I see many people who are in disabling chronic pain. It may have started as a simple whiplash from a minor car accident. There is a significant soft tissue injury that doesn’t show up on an X ray or MRI. They have a lot of pain but without any imaged injury they are frequently given a pain killer and told that it will heal on its own. This pain then dictates a certain posture to obtain some degree of comfort. It usually prevents them from sleeping well. They start to get fearful that they won’t get better. Long after the original injury has healed they have a collection of bad habits that perpetuate the problem. Preemptive protective contraction when initiating movement. The injured area contracts first. Inability to perform daily activities. The message to the brain is that the body doesn’t work. Reduced self image that they are falling apart. Inordinate level of suffering over and above the actual injury. As a therapist it can be very challenging to turn this pattern around. I start with an observation as to how much guarding they use to deal with the pain. I lift an arm or leg and assess how much they resist any change in position. You can do this yourself. Sit down and slowly lift an arm or a leg. If the injured limb is guarded it will be much heavier than the unaffected limb. This is a frequent factor in perpetuating the injury. Once I find a relevant holding pattern I proceed to restore some level of lightness and ease of movement. It is very important that the therapy be perceived as safe. The tension pattern came about originally as a response to pain. I have to proceed slowly and with very light effort. Frequently I start on the unaffected side to show how you can integrate the movement of a limb into more body segments so there is the perception of safe and easy movement. Sometimes the simple act of breathing can start a pattern of relaxation that you can expand from the ribs to the spine to the shoulder to the arm etc. This idea of movement so small and safe is usually alien to most people in chronic pain. Most modalities involve a much more forceful approach. Patients learn to protect themselves by increasing their muscular tension. A great example is that of a dancer who had been totally disabled from a fall. She could not sit, stand, walk or sleep without great discomfort. She was in this condition for 18 months. She looked great. She could touch her toes, and lift her leg well past her waist. Yet when I went to lift her leg it felt more like a dense heavy brick. In this case it took me several session just to have her allow any relaxed movement. We agreed that she was so used to forcing the movement that she was in fact perpetuating the strain pattern. Once she could relax I could get her to find a position of comfort which led to improved quality of sleep. it is very difficult to heal if you can’t sleep. This is therapy 101. Next we reviewed each aspect of how she rolled over in bed, sat, walked, and any other relevant activity. There is always a better way of using your body when you divide the effort into the entire body. No part gets overworked. She gradually regained confidence that movement could be done without pain. Using this safe and easy model we were able to restore her ability to use her body so she could return to hiking and yoga. Her body could trust that these activities were no longer painful. This is just one approach to chronic pain. Each person presents in a somewhat unique way. Sometimes the problem is more related to the patterns of movement rather than the resistance to movement. Sometimes there is a chronic collapse of the body when sitting, standing and walking. The skeleton is no longer doing its proper job so the soft tissue has to strain. After 27 years of specializing in chronic pain and movement dysfunction in two Boston hospitals, I have gained much experience in helping people find their way back to a more normal and productive life. What is good movement? How do you know that you are moving well? If a given movement hurts, what kind of strategies would you employ to learn a better, more functional organization that would work? Is there such a thing as a ‘work around”? Many years ago I tore my quad. You can still see the dent in my thigh. I could immediately go up and down stairs and even run without pain because I had a way of bypassing the loading up of the injured leg. In the accompanying video I explain these things, and demonstrate one of the more basic movements, which is how do you make your leg light by combining the lifting leg with the rolling pelvis. It is called “pelvic tilt knee to the chest”. This is one of the first lessons that I cover in almost every treatment I do. The simple reason for this is that most of my patients cannot even lie comfortably on the table without the knees bent or a support under them. Doing this move properly will relax and lengthen the low back..
Good movement is comfortable. It is easy to do. The effort is distributed amongst enough body segments so no one structure ends up straining. It is enjoyable. You can breath, smile and do it many times without effort. On the other hand, bad movement is a strain. If you monitor your breath you may find that it stops. If you are talking, your voice quality may change. These are signs that you are straining something. For the purposes of learning, a new movement should be done very slowly with very small amplitude. I like the idea of doing the lightest one inch move that you can. You may even do a millimeter. That small movement has to be done so well that it is super easy. It requires you to be mindful. Some people find that the meditative mindset is a good place to initiate the action. The smaller the effort applied, the more you notice. If you lift a piece of paper you will notice when a fly lands on it. If you lift a chair the weight of that fly will not be detected. This is called the Weber-Fechner law. It is very important to notice the first moment of increased effort. It is at this point that you can make a different choice than your usual habit. For example lifting a leg can strain your back. If you do it too fast you won’t know this until too late. Over time it can easily lead to a muscle ache. A simple idea that you can use in modulating effort is what I call the Fred and Ginger principle. This refers to Fred Astaire and Ginger Rogers, two famous dancers of the 1930s. He initiated the move and she effortlessly followed. It was almost instantaneous. In the leg lift example if you find it a strain to lift the left leg, then there are lots of other parts of your body that can initiate the movement. In this case, if you are on your back and you wanted to lift your left leg you could press down with your right foot and this will make it easier. The right leg becomes Fred and the left is now Ginger. So whenever you want to move a painful area do it” Gingerly”. This is the work around. This is all demonstrated in the accompanying video called Pelvic Tilt, Knee to the chest”. 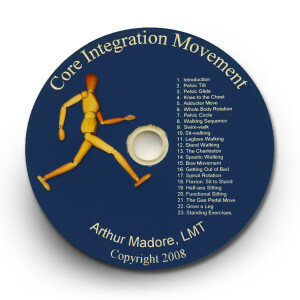 It is one of the many exercises on my DVD Core Movement Integration. DVD is $35 plus Shipping and Handling. Copyright © 2019 — Muscular Therapy of Boston • All rights reserved.